These tees come in a variety of colors and Jaipur patterns hand printed on a white tee shirt and then over-dyed in natural India dyes. 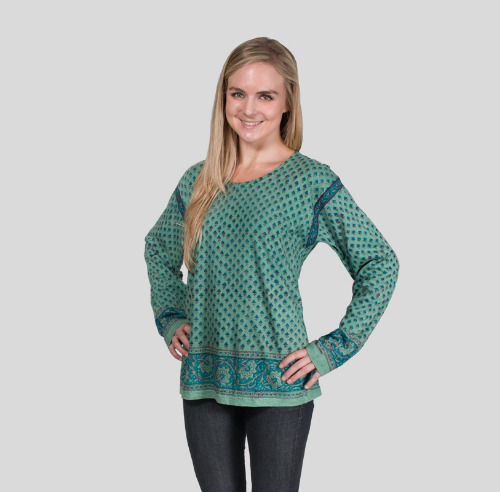 You Can Choose The Background Color Of The Tee But The Jaipur Patterns Come In Assorted Colors And Jaipur Patterns. Geeta Hippie clothes. Geeta Bohemian clothing. Artsy clothing for expressive women! Since 1972 Geeta of India has lead the way in creating classic gypsy hippie chick bohemian shabby chic styles for women and juniors. Handmade boutique styles at affordable prices. 100% cotton hand block printed classic ethnic Indian tee shirt top overdyed in natural India dyes. Natural India dyes are a bit more vibrant than the stonewashed colors without being bright. Great with jeans, indian harem or yoga pants, or long Indian bohemian hippy skirts.This classic tee is becoming very difficult to find. Very few artisans in India still make the fabric used to sew these wonderful tee shirts. Because of the handmade Nature of these tees, size and color variations are common of this fabric. Since the fabric is hand block printed there can be irregularities to the print. This is considered normal for this type of product. Get them while you can! Check the measurements below.